New Button Collection - "Birthday"
Just released in our on-line store. 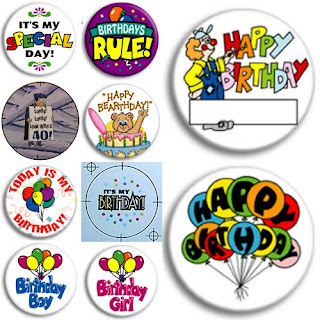 Ready-made designs for "Birthday" buttons. When made into buttons, you can wear any of them in your hat, pin them on your bags, give away as party favours, party invitations or greet a special friend or family member on their special day. Also, a good way of starting a button collection. Can be purchased as regular pinback buttons, magnetic, keychain, pocket mirror buttons in size 57mm. Birthday buttons can also be ordered in sizes 32mm, 38mm and 25mm as regular pinback buttons and/or in 77mm. Please click here for enquiries.